Chart-topping UK singers aren&apos;t much of a surprise. Adele and Amy Winehouse have both claimed these shores with their twist on Britain&apos;s long-standing interest in classic soul. And before that, James Blunt told everyone "You&apos;re Beautiful," becoming the first UK act to top the US singles chart in nearly a decade. The point is, America&apos;s got an occasional thing for British singers and when love strikes, it hits hard. Ed Sheeran is the latest Brit to aim for America with healthy ambition and toting a triple platinum album from back home, +. Big name support, specifically from Sir Elton John (a massive fan of the album and its breakthrough single "A Team.") won&apos;t hurt the cause. Nor will Sheeran&apos;s EP with Yelawolf, which drops tomorrow. 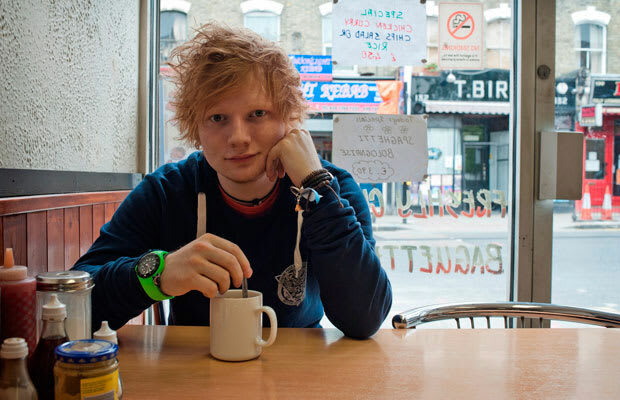 Born in Halifax, West Yorkshire, Sheeran (now 20) started recording and releasing music at the age of 14. At 16, he quit school and moved to London to get serious about his craft. The origin of Sheeran&apos;s mainstream success lies in an unlikely relationship with SB.TV, an underground "youth broadcaster" known primarily for hip-hop and grime freestyle sessions delivered straight to YouTube. Sheeran hit the platform in February 2010, performing a version of "You Need Me, I Don&apos;t Need You," which has since generated over 5 million views. His "new sound"—a hybrid of acoustic guitar, singing, rapping, and beatboxing—hit home, and Sheeran hasn&apos;t looked back since. So by now you&apos;re probably wondering Who is Ed Sheeran? Let&apos;s find out.